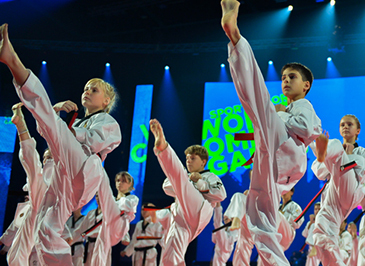 Russian children demonstrate prior to Taekwondo Competition of 2013 SportAccord World Combat Games, which kicks off in St. Petersburg, Russia on Oct. 23. ST. PETERSBURG, Russia (Oct. 21, 2013) —- The taekwondo competition of the 2013 SportAccord World Combat Games kicked off on Oct. 23, 2013 for a two-day run in St. Petersburg, Russia. The two-day taekwondo competition took place at the Arena Sport Complex, the home of the St. Petersburg basketball club Spartak. The venue also featured wushu, karate and sambo. The second edition of the SportAccord World Combat Games, which started on Oct. 18 and will run until Oct. 26, features 15 martial art and combat sports. Fencing and savate are newly added this time. A total of 72 athletes, 48 males and 24 females, from 11 countries participated in the taekwondo competition, which will be conducted in a five-on-five team tag match. Unlike the taekwondo competitions at the inaugural SportAccord in 2010 in Beijing, China, there are no individual matches this time. Eight countries compete for top honors in the male division. They are host Russia, Korea, Iran, Spain the Dominican Republic, the United States, Uzbekistan and Venezuela. Russia, China, France and Croatia will vie for the gold medal in the female division. Most of the teams were invited based on their performances at the 2012 World Cup Taekwondo Team Championships. Each team is composed of a maximum of six athletes, including one substitute, with their total weigh-in weights not exceeding 432kg. Among athletes are Steve Lopez of the United States, a five-time world champion, and Wu Jingyu of China, the gold medal winner in the women's -49kg category at the 2012 London Olympic Games. The tag team match consists of two rounds of five minutes each, with a one-minute break. Each team enters five athletes per each competition with one substitute. The first round will be conducted in a traditional team match format, under which each of the five athletes has to compete against his or her component for one minute in the order from light to heavier weight. The second round will be conducted in a tag-team match, in which athletes can be replaced any time after a minimum three times of attacks. The winning team will be determined by accumulated points after two rounds of competition. Male teams will be divided into two groups and the top two teams will advance to the semifinal round. For the male competitions, the preliminary round will be conducted in a round-robin format and a single elimination format in the semifinal and the final round. As a special program for the spectators, the WTF Taekwondo Demonstration Team will make two 30-minute demonstrations at the competition venue each on Oct. 23 and 24. Near the competition area, other taekwondo demonstrations are also scheduled as part of cultural programs. Sarah Stevenson of the United Kingdom, who earned her country the first Olympic medal in taekwondo at the 2008 Olympic Games, serves as the ambassador of taekwondo for the 2013 SportAccord World Combat Games.